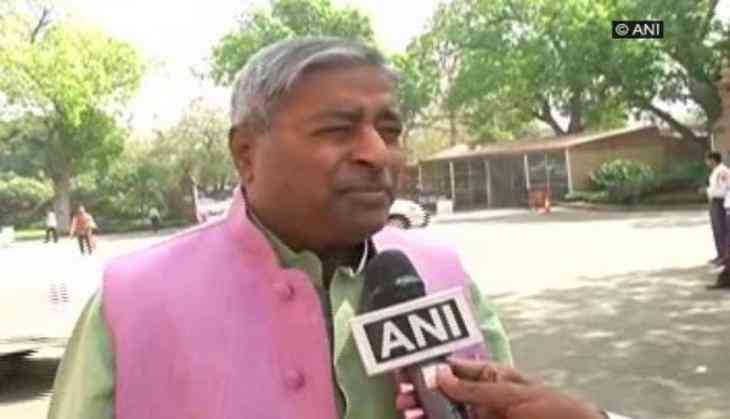 Speaking in support of the Ram Temple row, Bharatiya Janata Party (BJP) leader Vinay Katiyar on Tuesday asserted that the Supreme Court has made the right assertion and that the UP government should be given time as it was fairly new. "The Supreme Court has made the right assertion and we will move ahead in this regard. We have our government in Uttar Pradesh now and a pessimistic approach will now be initiated.I am confident that this matter will be solved," Katiyar told ANI. He further stated that the new government in Uttar Pradesh should be given time. "I think the new government in Uttar Pradesh should be given time as it has been only two days after they assumed office," said Katiyar. Taking a jibe at BJP national President Amit Shah's friendly talks with Prime Minister Narendra Modi he said, who has stopped the opposition from joining hands? "Who has stopped the opposition from joining hands? The BJP president and honourable Prime Minister Modi have been working to accomplish the ideology of 'Sabka Saath Sabka Vikas' for the country's development. I am confident that they will emerge victorious in their mission. We will emerge victorious even in the stated where polls will be held later," said Katiyar. Earlier in the day, the Supreme Court called for an urgent hearing on the Ram Temple issue, it called both the parties to solve the matter amicably. During the hearing, Chief Justice of India (CJI) JS Khehar offered to serve as a mediator, if negotiations broke down. "We have been ready from the start for the construction of both Mandir and Masjid at the site, but the Masjid should be constructed across the river," Bharatiya Janata Party (BJP) leader Subramanian Swamy, who is a petitioner in the case, told the media after the hearing. The top court put the ball in the court of the petitioners and the respondents by asking them to sort the matter through negotiations. Swamy sought an urgent hearing into the matter and mentioned to the apex court that the case is pending since last six years, to which the Supreme Court asked Swamy to mention it on or before March 31. The apex court is also hearing the appeals challenging a 2010 Allahabad High Court's decision fixing the exact birth place of Lord Ram at the disputed Ayodhya site. A three-judge Lucknow Bench of the Allahabad High Court had in September 2010 given a unanimous decision that Lord Ram was born under the central dome of the makeshift temple and Hindus have the right to worship there. Subsequently, the Supreme Court had stayed the implementation of the High Court's decision soon after. The case has remained in limbo ever since. In his petition filed under Article 32 of the Constitution, Swamy contended that the pendency of the appeals in the Supreme Court has restricted his fundamental right to worship and enjoy dignity of life under the Constitution. Swamy had earlier claimed that work on the construction of Ram Temple in Ayodhya could start before the end of this year and expressed confidence that the apex court's verdict would pave the way for construction of the temple.